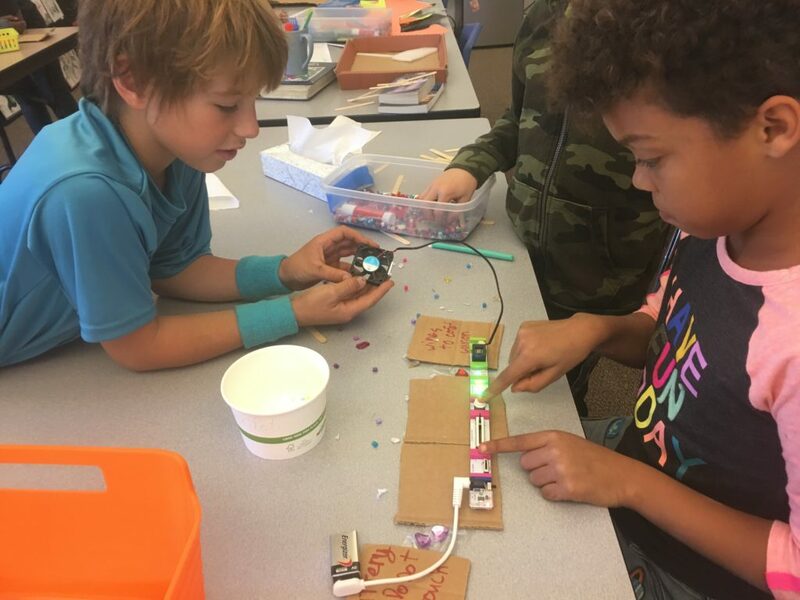 The students in the elementary school STEAM program, The Factory at Mount Madonna School (MMS), launched into a new level of inventing and making last week when they began using the littleBits platform in class. The littleBits platform was invented by Massachusetts Institute of Technology student Ayah Bdeir as a way to democratize electrical circuits. Her idea was to build an open-source platform that anyone could make, which would allow anyone to invent with electronics. 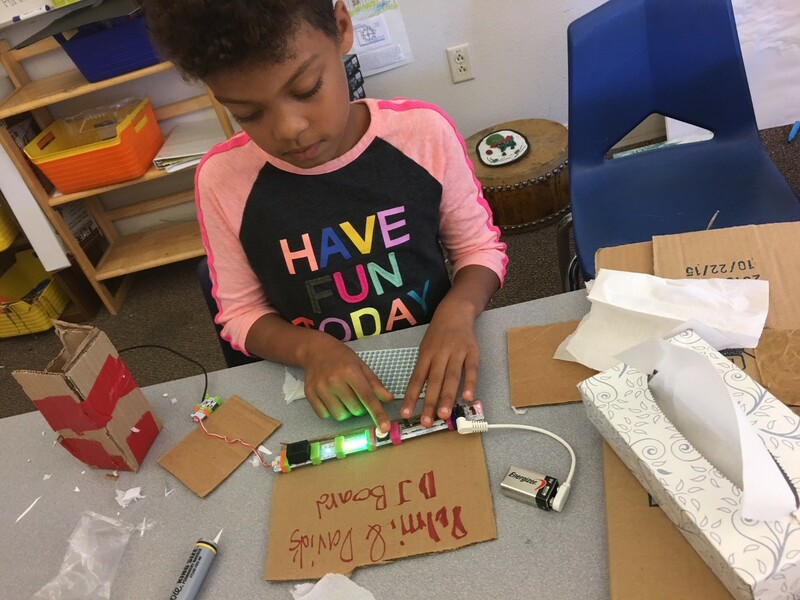 She hoped littleBits would make engineering with circuits accessible in the same way that Legos made structural engineering interesting for kids and people of all ages. 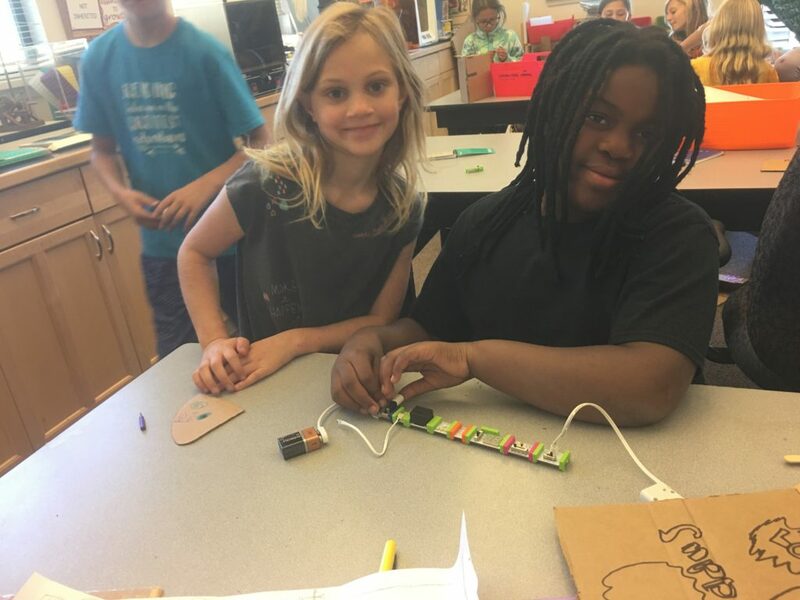 In prior years, our elementary students have learned about electrical engineering using Snap Circuits and raw components, including doing some delicate soldering as early as fifth grade. 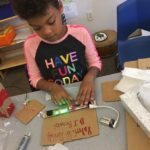 While these ideas and techniques are still being taught and used in the program (soldering is used in middle school), adding Little Bits opens up new possibilities for younger students. 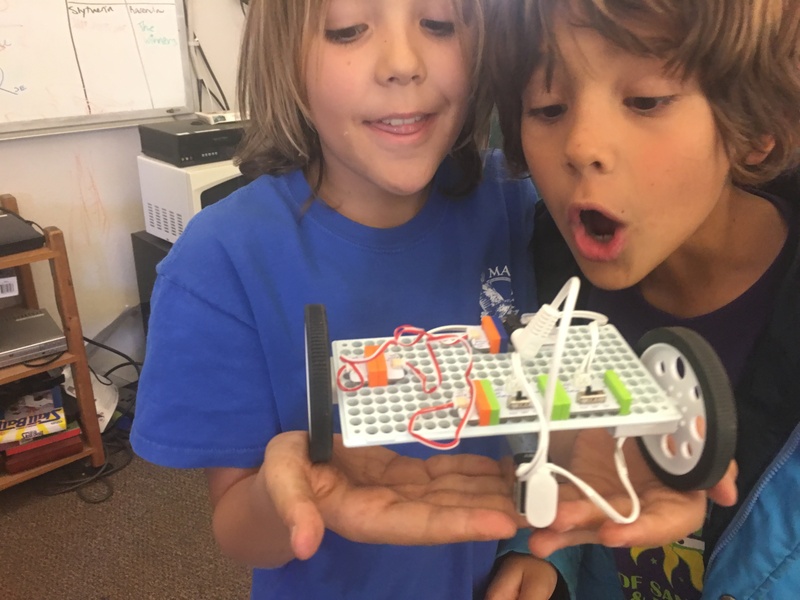 The idea is that color-coded pieces power a circuit and provide input (switches and sensors that turn the invention off or on), and also provide output (in the form of motors, slowly rotating parts, lights and sounds of different types). The pieces snap together magnetically so that they can’t be assembled incorrectly, and finished circuits are small enough to fit within almost any toy or invention the students can make. The current cohort includes our third and fourth graders. 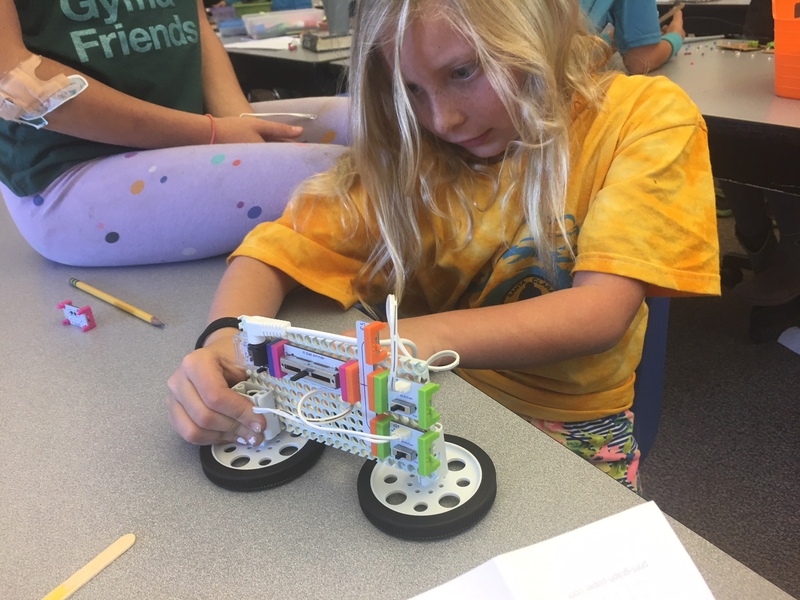 After an introduction and sample lesson with littleBits, the students entered the design phase of the engineering design cycle and created plans and schematics for inventions. Last week each group checked out their needed bits and began assembling circuits and fabricating inventions. 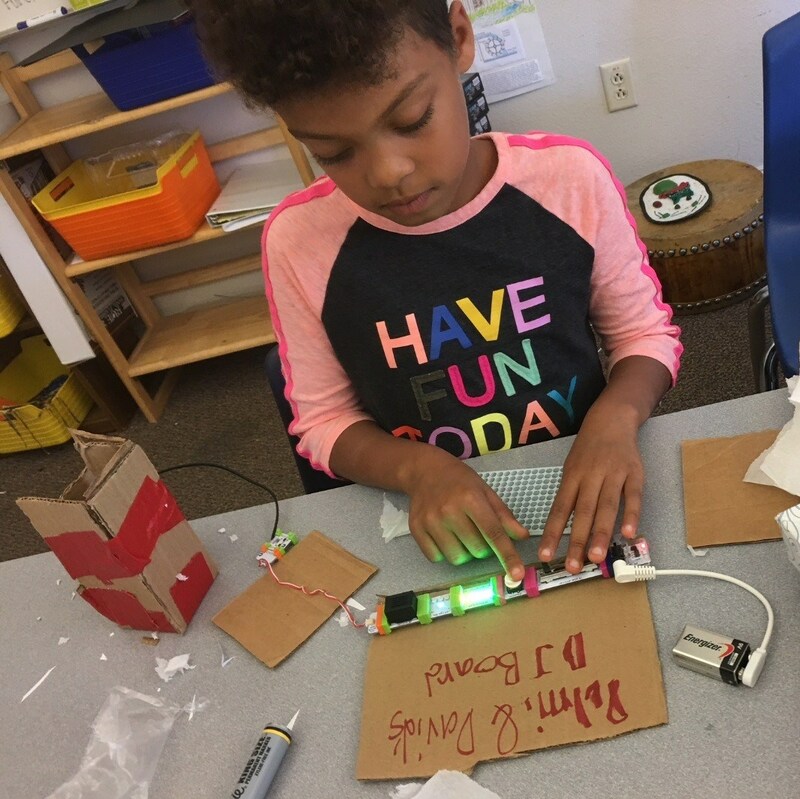 The students are busy creating drawing machines, night lights with light sensors, motorcycles, lie detectors, and miniature smart homes, among other things. Our STEAM/Makers’ program started in 2012 with an experimental workshop during our annual summer faculty retreat. MMS converted an unused classroom to an electronics-capable space and brought in a 3D printer. 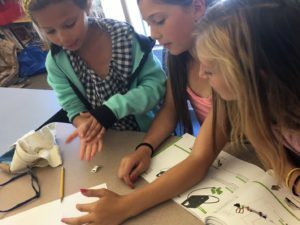 The program currently serves third through fifth graders in weekly 10-week workshops. Last year STEAM programs were integrated in sixth and seventh grade science classes, and in ninth grade physics. STEAM (science, technology, engineering, arts, and mathematics) is also used in our DaVinci Algebra class for eighth grade and our high school Frank Lloyd Wright Geometry course for sophomore and juniors.